Manifest Destiny – Part III. From the Great Plains tower the majestic Rocky Mountains. Welcome to my adventures to Manifest Destiny. In this journal entry I am “meditating across America”, in search of energy vortexes. Much like the awestruck feeling as I entered the city limits of Chicago (greeted by the impressive skyline), leaving the fertile plains of America’s heartland to be welcomed by the Rocky Mountains is in itself awesome. It is one thing to be impressed by the architectural marvels of humanity, but to see Mother Earths rendition of a mountainous skyline is even more striking. From farmland and corn to mountains that rise 12,000 feet off the table of the continent: The geographical transition is unexpected and alluring. After a stop in Golden, Colorado near Denver, I was greeted by steep plains and evergreen pine trees. Soon I crossed the Continental Divide at Loveland Pass (elevation 11,992 ft). I was impressed with the varying kinds of mountainous terrain: From granite peaks to red rock canyons and bluffs, to tundra wind whipped buttes. My focus in this region is the famed Maroon Bells near Aspen. The Bells are two extraordinary mountain peaks that reflect down on a crystal clear glacier lake basin. The lake reflects the massive snow kissed peaks and the many Aspen trees that dot its edifice. Across the valley lies contrasting maroon mountains that are equally impressive. Right now is the perfect time to visit as the valley floor is alive with color and texture from millions of blooming wild flowers. I found a quiet spot off the tourist path that encircles the lake and I settled into a mindful appreciation of the surroundings. The loud but relaxing sound of a bustling creek could be heard echoing across the valley. Centered and present, I focused on my breathing: “In with positive energy, out with negativity”, as I inhaled and exhaled. Views of white puffy clouds, smells of wild flowers and a sense of everything being right in the world enveloped me; I closed my eye’s and let the sounds of nature permeate my being. There is definitely something going on here; something beyond the ordinary. It is one thing to be captivated by a thoughtful tree, a grand mountain peak or a lake reflecting the days beauty; but to combine all of this into one picturesque view is intoxicating. A sense of freedom, reverence and a luminous feeling bubble out from within. This is pure, unadulterated and unfettered. Wow, what a feeling! About 15 minutes may have passed and then comes a loud rustle in the bushes near me., rousing my Zen moment. In the interest of not being eaten before I reach the ocean, I am going to move back to the path and resemble a tourist like the others. The jarring effect of being startled was not conducive to the meditation at hand. Still, even after returning to the main path, I felt a sense of peace and inspiration. I wanted to immediately race to my lodging and write this blog. 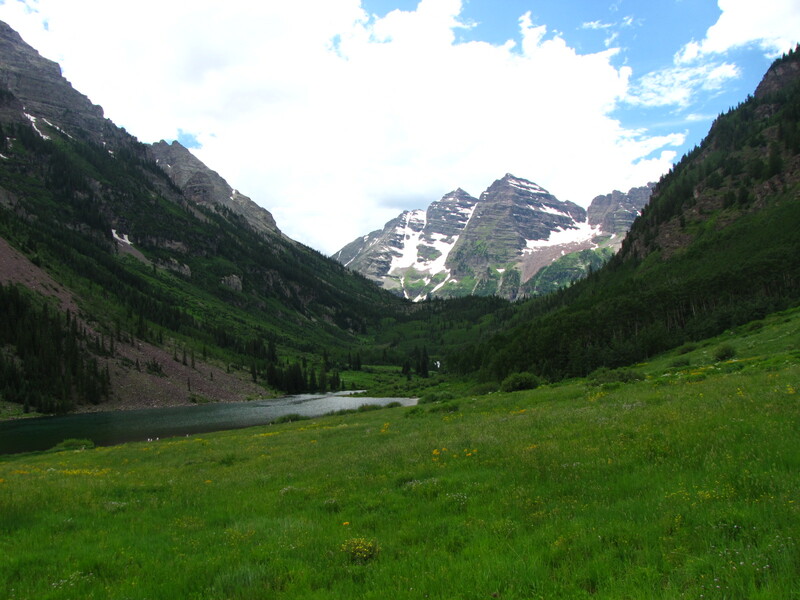 The Maroon Bells is an amazing place. 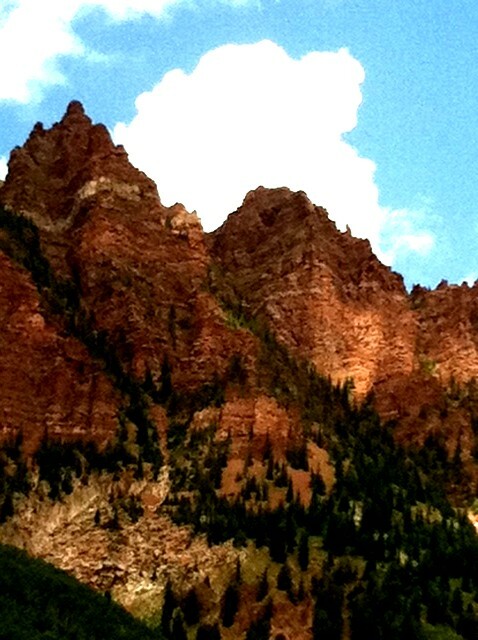 One can almost visualize the energy swirling above, captured by the sure immensity of the mountains. The lake reflects this dynamism which further expands this vortex of energy and responsiveness that seems to enter and exit my conscious; leaving behind this feeling of bliss and clarity. Emotions surface from deep within: A notion that anything is possible and everything is as it should be. A smile swells across my face for no apparent reason – Jack Pot! Compared to the city and farmlands of the Great Plains, nothing can compare to the Alpine vistas of Colorado. There is an energy that is akin to the mountains, rivers and trees. For reasons I can’t fully explain these extreme natural elements hold and harness this mysterious energy in ways only described by quantum physics. There is this definable energy field that pulses though everything and when you open yourself to its offerings, amazing feelings of grandeur greet the heart and mind, merging them as one – if only for a few moments. Those few moments seem to be enough. It seems all of us need to pay more attention to nature, even those seemingly ordinary parks and reserves near our homes. It is easy to take these amazing gifts of nature for granted. « Manifest Destiny – Part II.